In the will of Sir Russell Grimwade (1879-1955), he allowed the University of Melbourne to spend bequeathed funds on ‘books, pictures and furniture’. His intention was to further furnish Miegunyah, the Toorak house his wife Mab subsequently left to the University to be used, in part, as a house museum. This use proved impossible and Miegunyah was sold with the income forming the Russell and Mab Grimwade Miegunyah Fund. Over the last year, this Fund has supported the acquisition of thirteen works of art, carefully selected to enhance the Grimwade Collection of art and books relating to early Australia. In October 2018 an elegant oil painting depicting Melbourne from the Botanic Gardens, in its original gilt frame, was purchased at auction. This is the first work of art by Henry Gritten to enter the University of Melbourne Art Collection. Born in 1818, Gritten was one of the most experienced artists working in the Australian colonies, having trained and exhibited in London before travelling to New York, where he painted landscapes for several years. He arrived in Australian in 1853 and moved between Sydney, Hobart Town, Melbourne and Launceston, where he died. 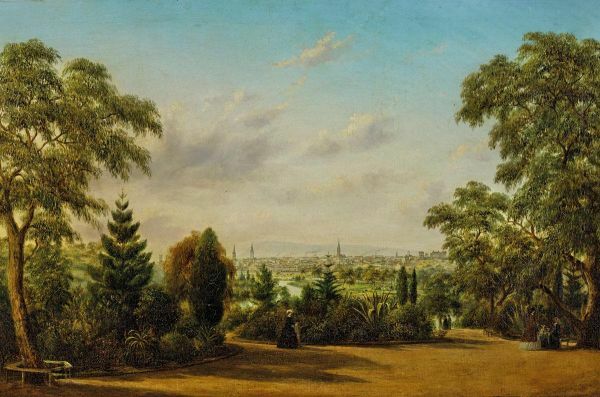 Within these formally laid out grounds, well dressed Melburnians promenade, admiring the exotic foliage that has been planted and the view across the Yarra floodplains to the south-east corner of the city, with church steeples and government buildings on Spring Street outlined against the distant Macedon Ranges. Contemporary photographs from this same position show the accuracy of Gritten’s rendition of foliage and features, although replantings and redesigned pathways mean that the location can no longer be confirmed.